Tucsonans are blessed with perhaps the most diverse selection of fresh local produce anywhere. Of 110 produce items in a fairly exhaustive “shopping list” I put together, 95 are produced sometime during the year in or around Tucson. We don’t do very well by tropical fruits [avocados, bananas, coconuts, guavas, lychees, kiwis, mangoes, papayas, pineapples, tamarindos] because of winter cold snaps. Berries like blackberries, blueberries, and raspberries find our summers too hot. And some root crops, like jicama and ginger, aren’t crazy about Tucson. Now someone’s going to say their uncle has a banana tree somewhere in Tucson that squeezes out the occasional fruit, but I am talking about production substantial enough to take to market. I admit to specificity bias, which is to say, I could – for example – increase Tucson’s “locoscore” significantly by breaking “lettuce” into romaine, bib, and so forth. And this list is based on an analysis of Tucson produce, and so includes some things, like prickly pear, that are not common elsewhere. And comparing the utility of tomato versus quince availability is worse than comparing apples to oranges. How about durian or Chinese broccoli? Increasingly obscure items added to the list could both hinder or help Tucson’s locoscore. My list assumes outdoor growing; greenhouses expand the offerings considerably in our kitchen, but not in this analysis. I count each plant only once, even though it might yield more than one produce item [like beets and beet greens]. A prickly pear plant yields both fruit and vegetable. I arbitrarily call it a vegetable for the sake of this analysis. As a reality check, let’s compare how well Tucson does with respect to two published sources, and compare these with my shopping list. I’m breaking the produce items out by culinary fruits and vegetables. In this regard, I follow the convention of the referenced texts. A culinary “fruit” is a botanical fruit that is sweet, likely to be associated with breakfast or dessert, and frequently or always eaten raw. A culinary “vegetable” might or might not be a botanical fruit, but it tends to be not so sweet and more likely to be cooked. Nuts, mushrooms, and sprouts, are absent from my analysis. The “locoscores” from my shopping list and the two books are all in the same ballpark. Tucson does better in my shopping list than the books. Tucson tends to do a better job at growing vegetables than growing fruit and my list is heavily vegetables [72% versus 61% and 62%] and loaded with particularly local vegetables [such as prickly pear and purslane] unknown and unappreciated elsewhere. Of course, not all produce items are in season all year round. That would be silly. January, February, and March are the months with the greatest diversity of local produce in Tucson. The selection falls off sharply from a yearly high of 45 items in March to 25 in April. It bumps along in the 20’s until plunging to a yearly low of 18 items [amaranth greens, apples, cucumbers, dates, eggplants, grapes, okra, potatoes, pumpkins, purslane, sweet corn, sweet and hot peppers, snap beans, summer and winter squash, tomatoes, and turnip greens] in September. The local selection climbs gently through the fall through November and sharply in December to 35 local items available. The selection continues to climb through January and February to the March high. It is important to note the arguably obvious, that a month is an arbitrary slice of time, and for discussion, fruits and vegetable seasons are pressed into this arbitrary framework. In the garden and market, however, fruits and vegetables appear and disappear throughout a month, and not in lockstep on the first. 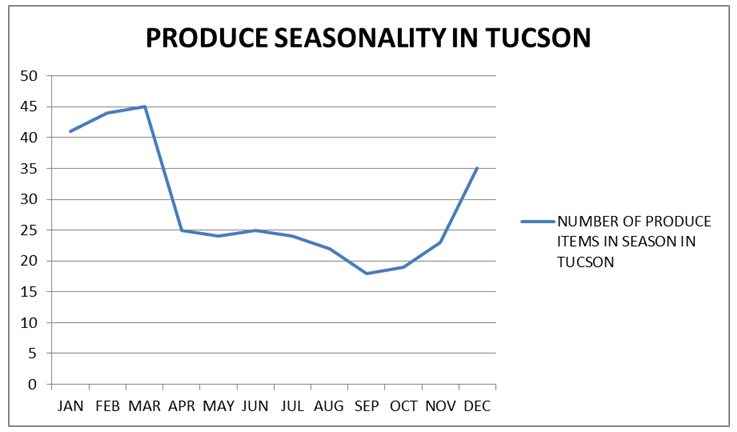 The people that spend their days trying to bring tourists to Tucson should be tickled to note that the prime months for diversity of local produce consumption – January through March – coincide pretty sharply with the Tucson tourist season. That’s a nice coincidence for our city of gastropods [basically a stomach with a foot attached]. And us snails that slither through the summer get treated to a fabulous selection of local summer produce items, less diversity than in winter but never-the-less scrumptious. By eating with the local seasons, you can enjoy produce at its highest quality and lowest cost – that’s a great deal! You can also gain in “cosmic consciousness” – the capacity to comprehend something of the turning of the universe — simply because you know you might have to wait for the earth to move to enjoy your favorite local fruit or vegetable, or eat quickly before the earth moves enough to change the seasons and fruit and vegetable selection again.